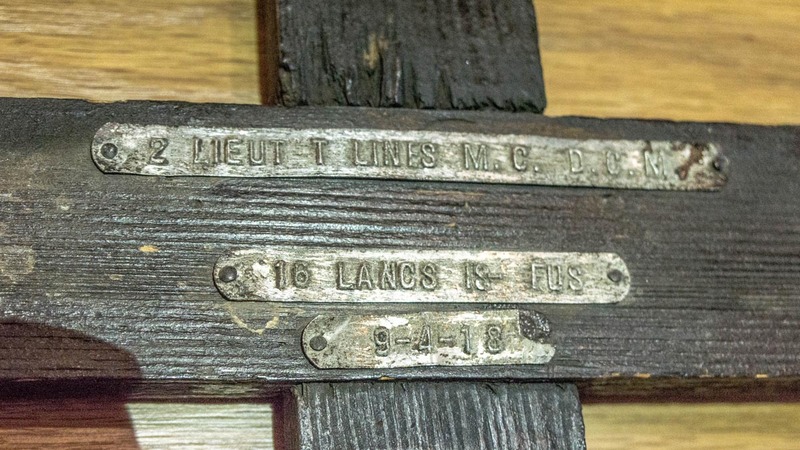 The cross commemorates 2nd Lieutenant Thomas Lines (2nd Salford Pals, 16th Battalion, Lancashire Fusiliers). 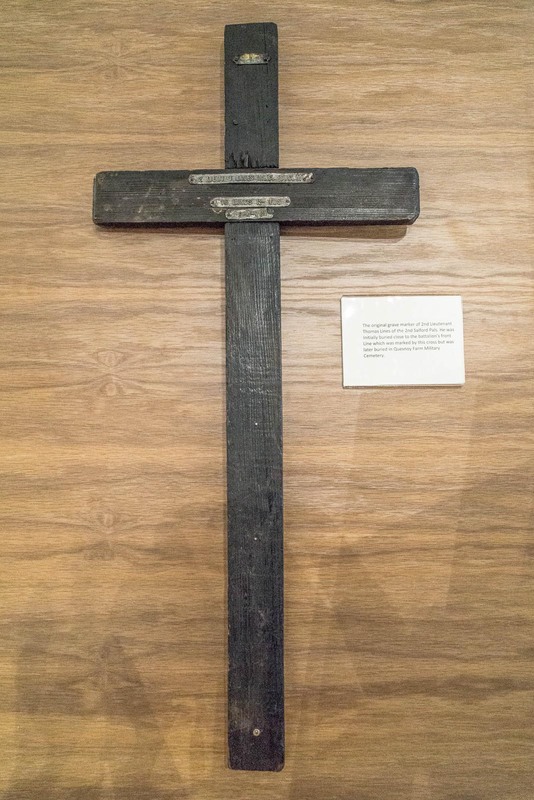 Location: The cross features in the World War One section of the museum. 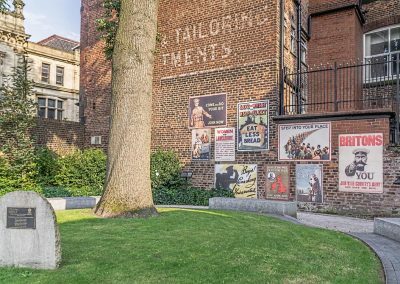 The whole museum is dedicated to the history of Lancashire Fusiliers regiment from early beginnings to the modern day. Mounting to wall: Fixed onto the wall with screws. Evidence of use in field (earth marking, cracking, staining, shrinkage): There is discolouring and cracking of the wood which shows it has been inserted approx 175mm into the ground. Finish (varnish, paint, oiled, unfinished etc): Unfinished rough dark wood. Condition (cracked, paint peeling, woodwork, damage etc): Quite a lot of cracking in places, especially just above the cross beam. There seems to be differing dates as to when Thomas died. 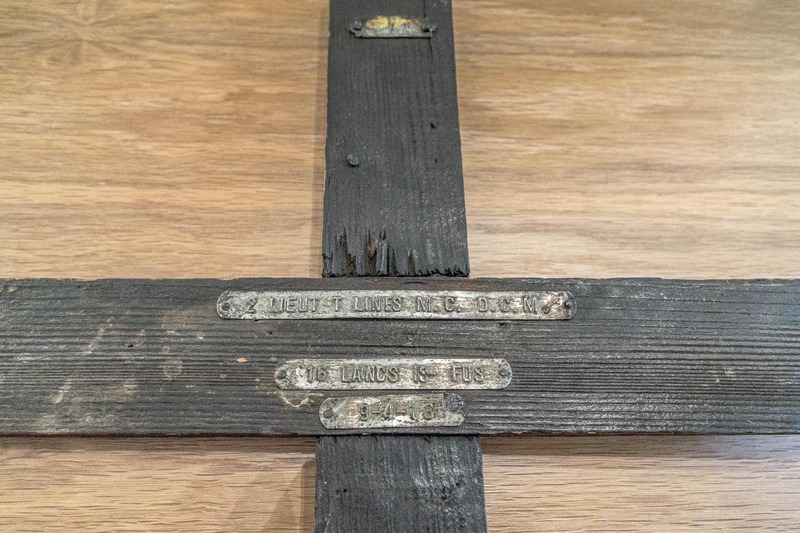 The date on the cross is 9th April 1914, however the War Graves Commission has 5th April 1914. I managed to find some information about Thomas’s life – he was born on 8th December 1885 and was the fourth child of Sarah & Thomas Lines. He went to school at the British School on Chestergate and furthered his education by attending the Sunday school at the Edgeley Primitive Methodist Church. 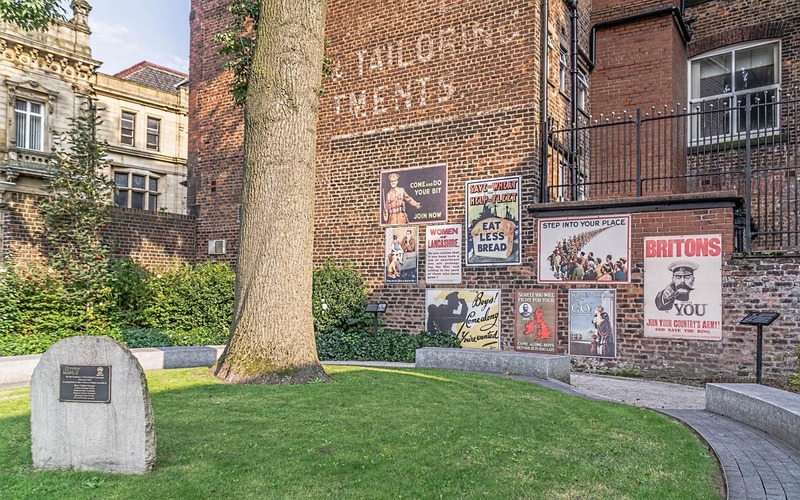 Like many local men, Thomas went to work in one of the hat making factories around Stockport and was employed as a felt hat finisher at the works of J Moores and Sons, Denton. In 1907, he married Gertrude Walker at St Augustine’s Church, Brinksway and they are thought to have set up home at 22 Yule Street, Edgeley where, over the years, the couple would have three children (Polly, Thomas and Elsie). 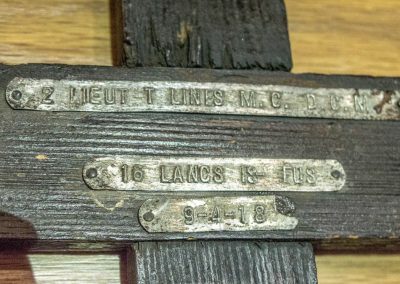 When war was declared in August 1914 Thomas enlisted on 5th September into the 10th Battalion, Cheshire regiment and given the service number 16313. On 16 July 1916, Thomas was admitted to 12th General Hospital at Rouen. He had received a gunshot wound in his buttock. This will have been received during one of two attacks on German positions at Bazentin on either the 14th or 15th. He was treated at 45th Casualty Clearing Station where his condition was stabilised before onward evacuation to Rouen. He returned to duty on 14 August. It was not long before he was back in trouble again. On 23 November, he was charged with conduct prejudicial to good order and discipline. He had been found, after midnight, drinking alcohol and starting a disturbance in the company of private soldiers. It was, clearly, not a good thing for a senior NCO to be drinking socially and, no doubt, becoming unpleasantly drunk when men to whom he had to give orders were around. Shortly after this, he had a few days leave in the UK. Unusually, he was transferred to the 13th Battalion in May 1917. 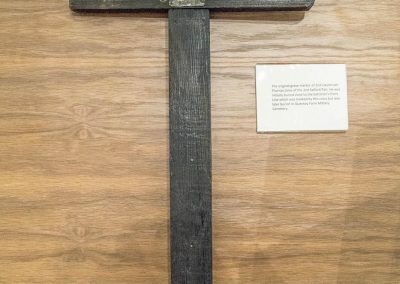 Soldiers would regularly be transferred but usually only after a lengthy period of illness or recovery from wounds when it be decided that the new unit was in greater need of replacements. Thomas just seems to have been transferred. Perhaps his commanding officer just got fed up with his poor discipline and thought he needed a fresh start. Thomas had applied to become an officer in December of 1916 but this had been rejected. He tried again in March 1917 and was accepted. Thomas died of wounds he had received. 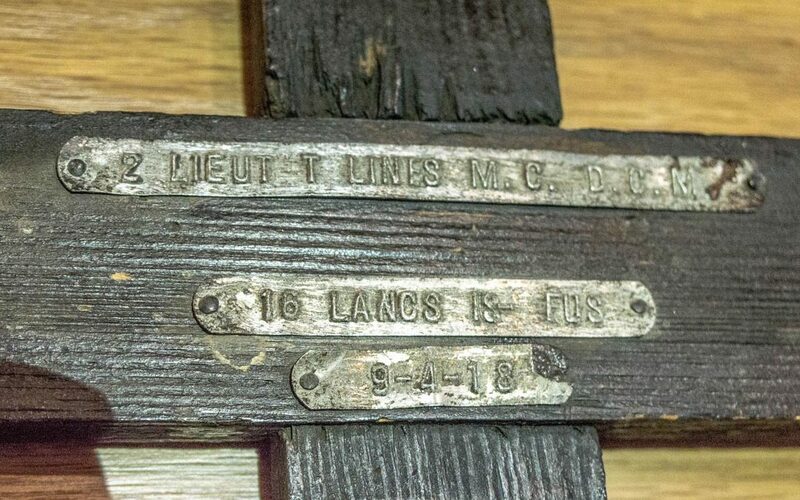 His burial so close to where the Fusiliers were suggests that he was injured either the day he died, or the previous day, before he could be taken to hospital. However, on the nights of 1, 2 and 3 April, parties of the 16th Battalion had attacked small posts held by Germans around the village of Ayette. The Regimental History notes that five officers were wounded over these days and it is possible that Thomas was one of them. 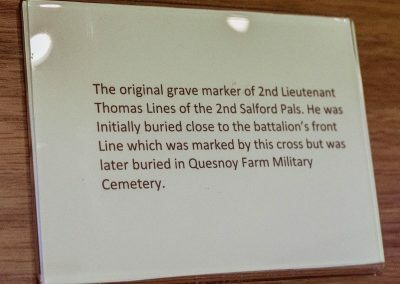 Thomas was later buried in Quesnoy Farm Military Cemetery. 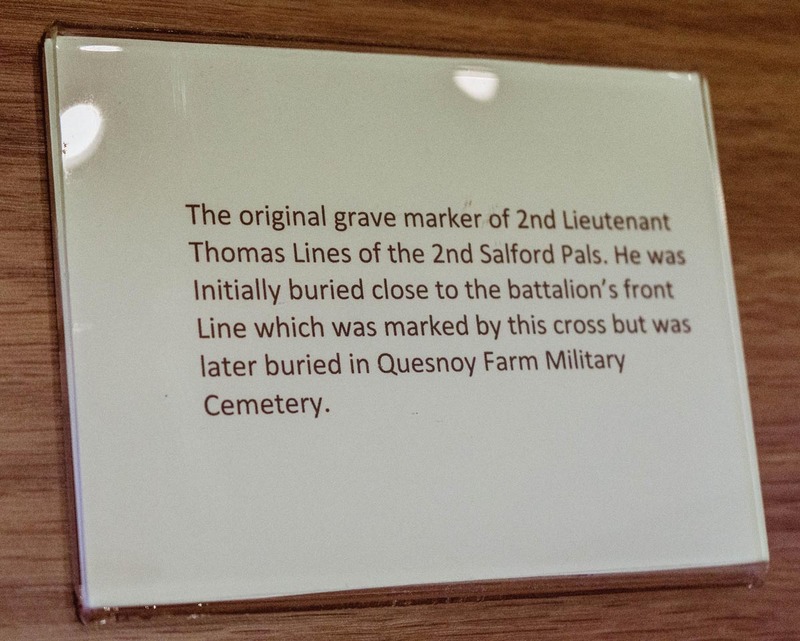 (Information courtesy of http://www.stockport1914-1918.co.uk/ – More than just a name). 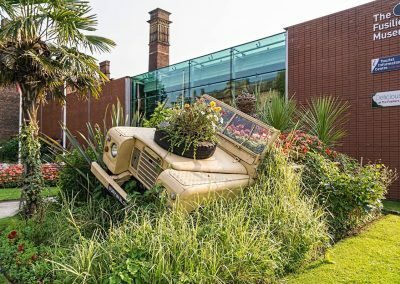 The Fusilier museum in Bury is well worth a visit. The Lancashire fusiliers are also famous for the ‘6 VC’s before breakfast’ – when half a dozen Victoria crosses were awarded on the morning of 25th April 1915 for bravery in the Gallipoli landing. The successful capture of ‘W Beach’ however came at a terrible price with up to 700 members of the regiment being killed or wounded. The garden outside the museum is dedicated to the courage that day and is a peaceful place to reflect. It’s also worth noting that once an entrance ticket has been purchased for the museum, it is valid throughout the year.